Since the helper T-cell bonds with specific antigen presented by dendritic cell and that same helper T-cell also activates B-cell by bonding with antigen presented by B-cell, it made me think that the antigens presented by both of them should be same. If that specificity is true, then what's the difference between an antibody and T-cell receptor? Because both T-cell receptor and Antibody are specific to an antigen. B cell receptors (BCR) work on a similar paradigm, but a different mechanism than the TCR completely, structure aside. 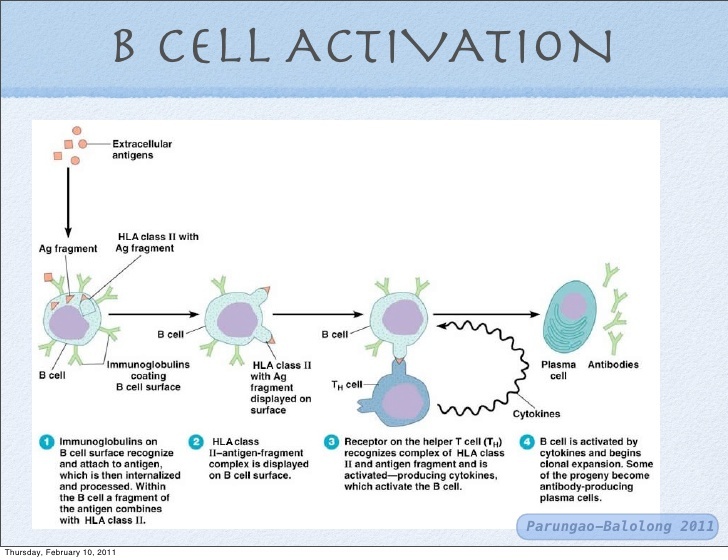 When a B cell encounters an antigen that binds to it's BCR, the receptor-antigen complex is internalized where it's processed onto class-II MHC. The peptides have to be processed to ~22-residue fragments to load on MHC-II, and the whole antigen is thus fragmented on the extrinsic processing pathway. To be specific, one antigen becomes many different peptides on many different MHC-II on the same B cell. You can imagine this produces some diversity among peptides suitable that at least one Th cell with similar specificity might bind. Class switching and somatic hypermutation that the B cells undergo help them attain greater utility and specificity, and the membrane-bound BCR is alternatively processed so that the c-terminus domain traffics antibodies to be secreted (2). On the other hand, the TCR is specific with a little wiggle room to a particular MHC-I or II loaded peptide, with the exception of yδ T cells which have been shown to be largely MHC-independent (3). The same situation follows, however, that your antigen presenting cell or APC has many different peptides of the same antigen loaded on MHC, just as cells expressing MHC-I might, which means that the T cells are also not recognizing the same exact peptide sequence. Since they originate from the same antigen, however, your cytotoxic and helper T cells can be specific for the same "target."